Italian yacht builder Cantiere Navale Cerri, part of the Gavio Group, has presented a line of yachts designed by Studio Spadolini. The move comes at a time when the builder is experiencing a self-proclaimed “rebirth”, having also recently presenting a restyled version of its 102 Flyingsport line, which they have received a new order for, and a new series of expedition yachts built in steel and aluminium called Phileas, which were introduced at the Miami boat show. The builder also has bought the iconic American sportfish yacht brand Bertram. 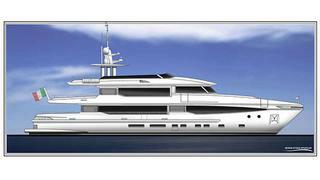 Now Cerri further diversifies its lineup with a new Navetta range, presented in 24 and 35 metres LOA. Built in steel and aluminium, the yard gave designer Tommaso Spadolini a brief to design pocket megayachts that had spaciousness and comfort normally found on larger yachts in a smaller package. "This Navetta represents yet another step forward in Cerri’s evolution, on the way to becoming one of the leading players on international markets," says Cerri's CEO Diego Michele Deprati. "We have breathed new life into some of Cerri's historical projects, such as the 102' Flyingsport, and introduced two new product lines, the Explorer and this Navetta, in just two months”. The Cerri Navetta 35 offering, pictured above, stands out with an unusual interior layout for a yacht of her size, which sees the main deck dedicated to guests with a master stateroom and two VIP cabins. A further two VIPs are found amidships on the lower deck, and she accommodates 10 guests overall. There are also cosy accommodations for crew with two double cabins, a crew mess, laundry, and a cold storage room – a big-boat feature that was brought into the design. The galley is on the lower deck as well. The captain’s quarters are on the upper deck, aft of the bridge, followed by a 40 square metre skylounge, indoor dining room with seating for 10, and a deck space with dining for eight. Up above is a 34 square metre sun deck with the requisite sunpads and barbecue for entertaining, and a Jacuzzi is optional. Engine options include twin Caterpillar C18 Acerts or twin MTU 8V 2000 engines, delivering a max speed of 14 knots or a cruising speed of 12 knots. For an even smaller pocket superyacht, Cerri's second design is for a 24 metre, which can be had in a steel hull with aluminium superstructure or built entirely in aluminium. The Navetta 24m features a wide-body design, which afford a spacious 40 square metre main saloon and dining area with windows that stretch to the ceiling. With a more traditional accommodation layout, the master is found the main deck and the guest staterooms are on the lower deck. The upper deck has comfortable lounging for al fresco entertaining, while the flybridge is fitted in the design to be dedicated to sunbathing.